Pioneers in the industry, we offer Shoe Shining Machine such as Automatic Shoe Shining Machine, SS Shoe Shining Machine, Automatic Shoe Shine Machine and Electronic Shoe Shine machine from India. Automatic Shoe Shining Machine is operated on the infrared system. 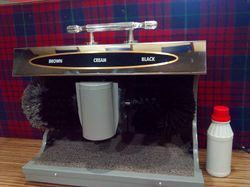 As you insert your shoe in Auto Shoe Polish, Shine Polish Machine, the sensor is automatically activated and the soft brush starts rotating, it remove dust quickly from your shoe, press the shoe against the nozzle of the cream polish dispenser and hold it under the black or brown brush. It take just 30 seconds, you have your shoes well polished, shiny and sparking. 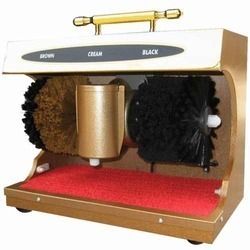 We have complete allegiance in wholesaling and supplying wide assortment of high in class SS Shoe Shining Machine. It is the easiest and quickest way to shine shoes, as it is equipped with two brushes that efficiently remove dust and then apply polish to the shoes. This device is developed with 200 ml shoe polish capacity, which drops only 2 ml at a time for optimum shine. Our prestigious clients can order this high performing machine from us at a market leading price. We are actively engaged in offering best and most excellent quality assortments ofElectronic Shoe Shine Machine. 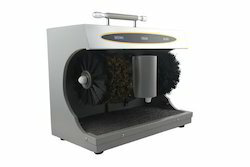 These shoe shiner machines are designed for shoe polishing. They are available with smooth brush and two polish options. They are highly used in offices and schools for offering free shoe polishing services. They are affordable, accurate and fast process. 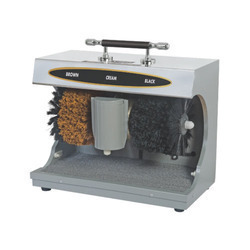 We are actively engaged in offering best and most excellent quality assortments ofElectronic Shoe Shine Machine. These offered machines are designed for show polishing. They are available with smooth brush and two polish options. They are highly used in offices and schools for offering free shoe polishing services. They are affordable, accurate and fast process.